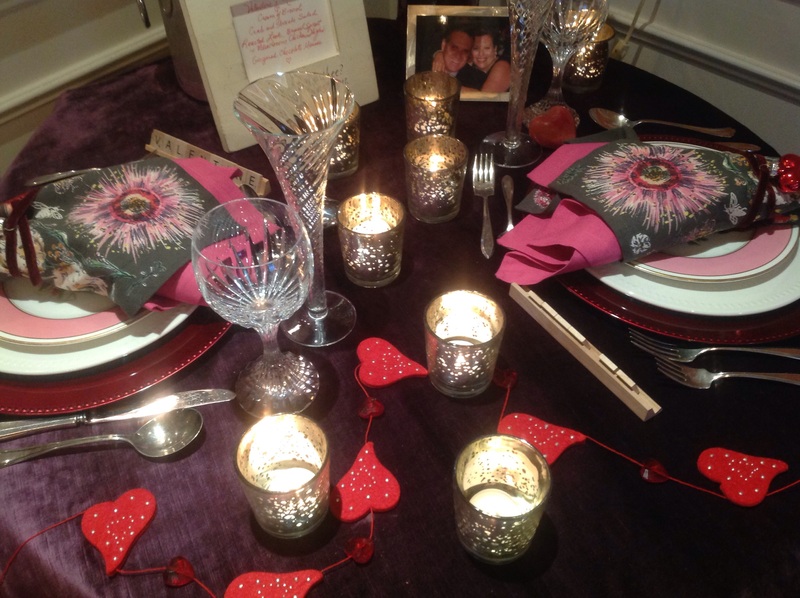 Whether you celebrate Valentines’ Day or not, this intimate table setting could also serve as inspiration for a special anniversary dinner, which in my case, is one and the same. 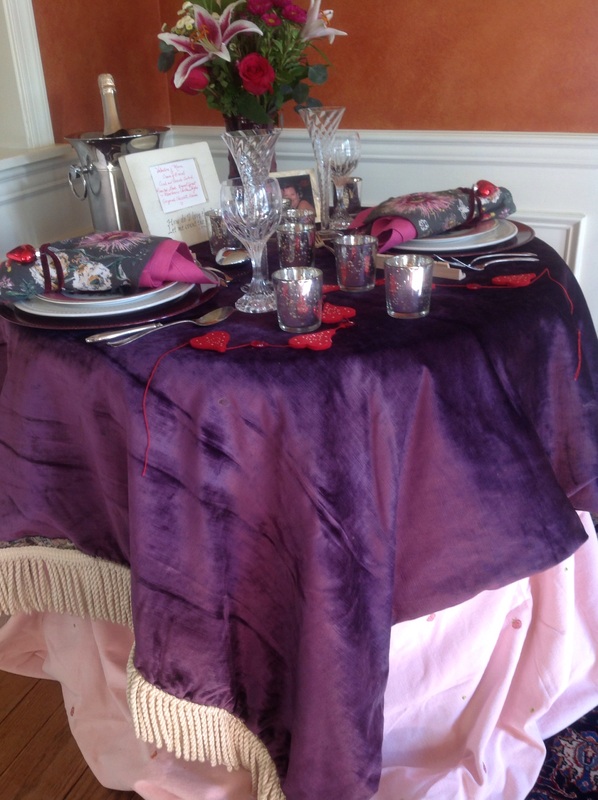 that I fell in love with when featured on Coco and Kelley last fall in the gorgeous tablesetting here. I loved their modern gray color and bold botanical motif. I layored a bright fuschia napkin inside the botanical one for a splash of color and tied them with a criss crossed velvet ribbon with a heart ornament(JoAnn’s) threaded on. To keep the table intimate, a smaller round table was draped with a pale pink underskirt and a rich velvet throw for texture and drama. Elegant red chargers held everyday cream dinner plates and fancier pink rimmed floral china salad plates. Mixing high end and low end china creates energy and interest on a table. 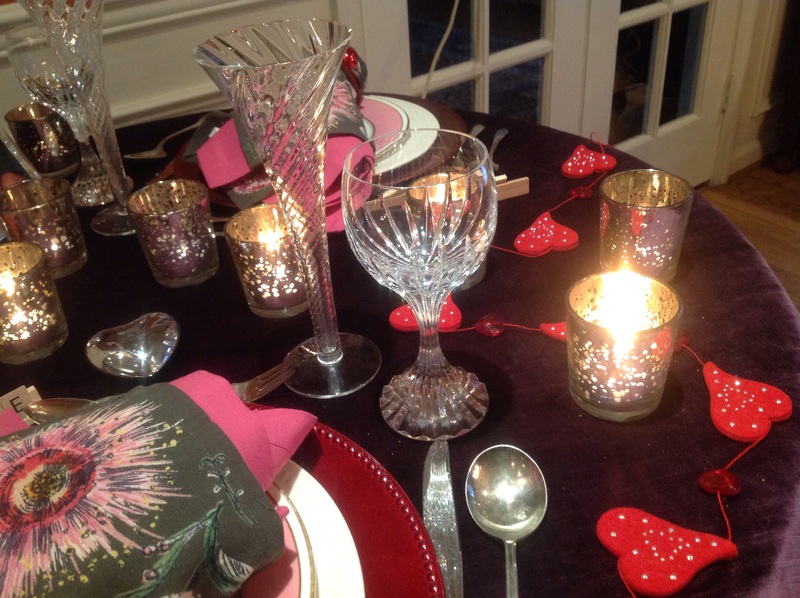 The Baccarat wedding crystal wine glasses were mixed with fun glass champagne flutes. 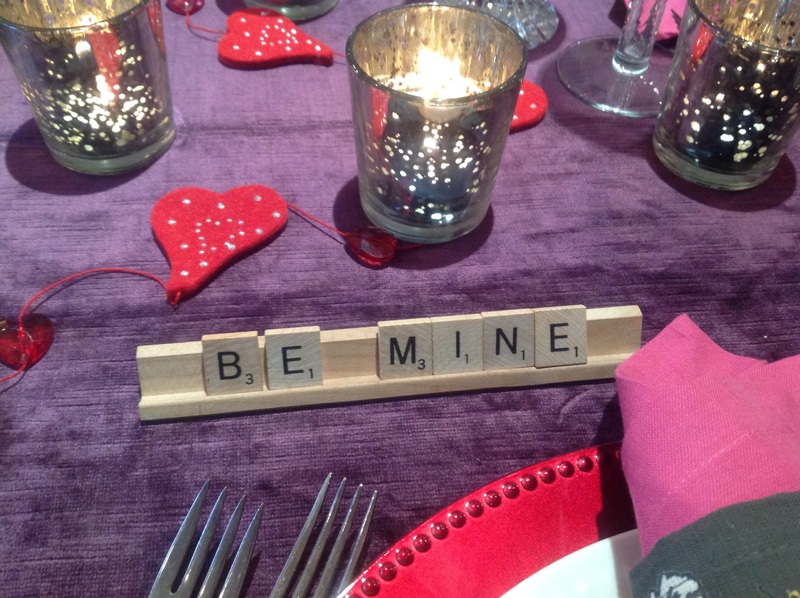 Instead of place settings, whimsical Scrabble lettering spelled a Valentine message. Silverware was my husband’s great grandmother’s. 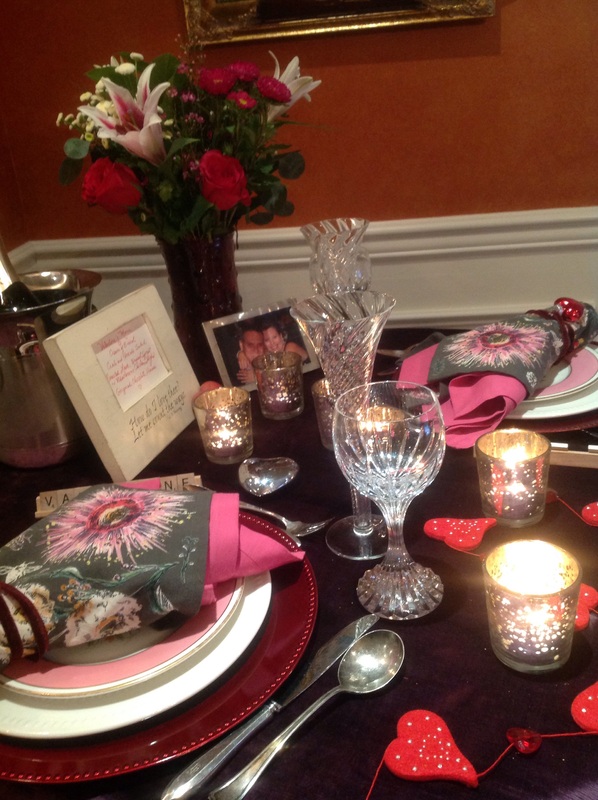 I scattered numerous mercury glass votives(Tuesday Morning) across the table for romantic candlelight. 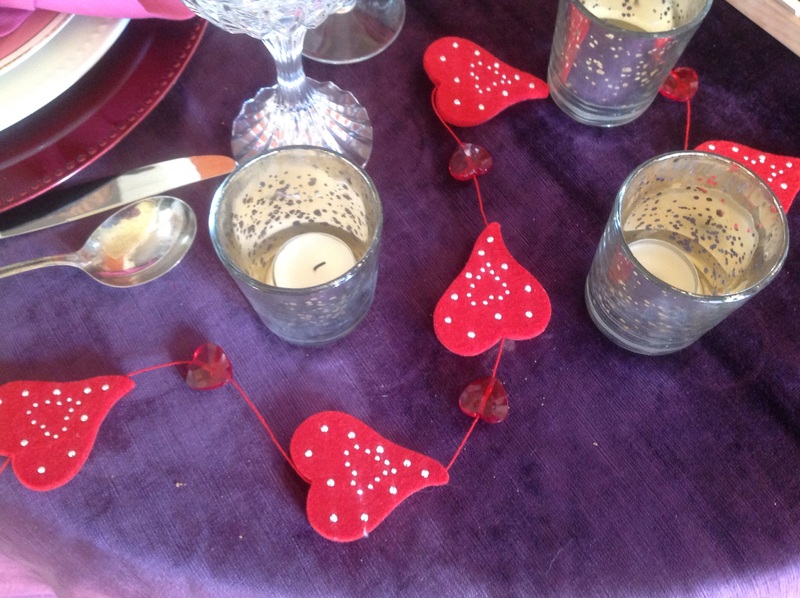 A boiled wool heart-and- crystal Valentine banner(JoAnn’s) was casually intertwined around some of the votives on the table top. 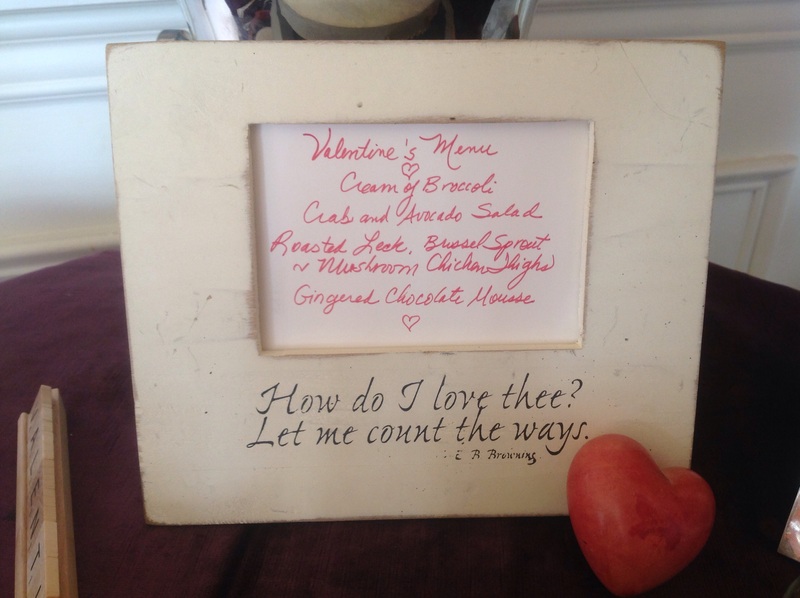 The menu was written in a frame with a favorite Elizabeth Barrett- Browning quote for another touch of sentimentality and whimsy. The casual wooden frame with patina scales back the fussiness of the crystal and silver and complements the wooden Scrabble letters. 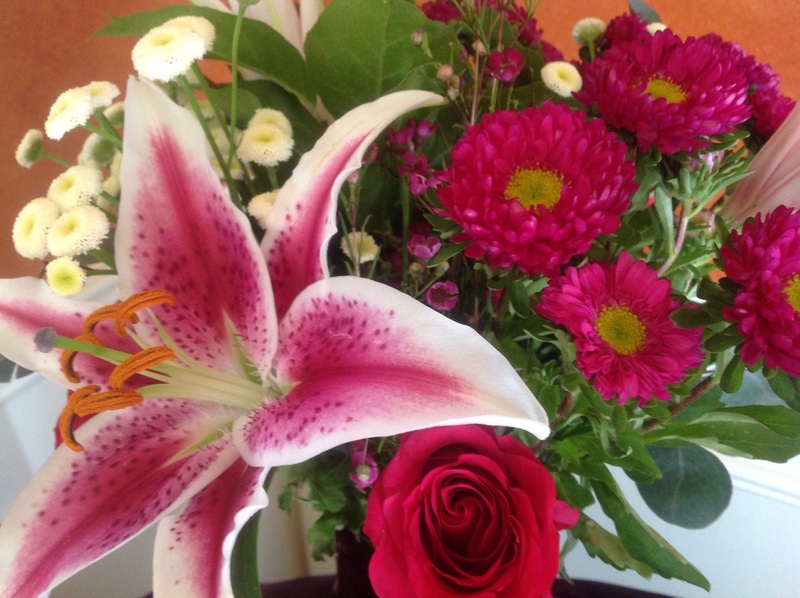 The bouquet of flowers in pinks, reds and whites arranged in a red vase was right from the supermarket and set to the side so as not to interfere with conversation. A favorite picture in a silver frame of the guests of honor is set on the table along with some decorative hearts in silver and pink, adding to the romantic theme. 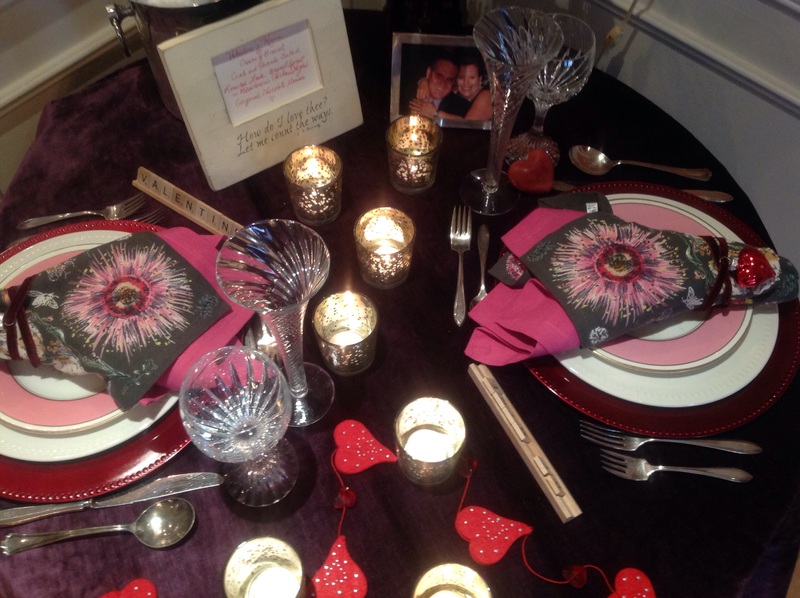 A bottle of champagne chilling in a silver ice bucket completes this tête-à-tête tablescape. I am dedicating this post to my favorite tablescaping friend Alycia Nichols from Table Twenty One, whose creative and inspiring tables are dearly missed while she convalesces from surgery. Check out Alycia’s amazing creations here. Participating at Share It One More Time. This entry was posted in Entertaining, Tablescapes and tagged Anthropologie black floral napkins, anthropologie botanical napkins, jewel tones in a valentines day table, romantic dinner table for two, romantic valentines day table, Using acrabble letters as placecards, Valentines day table setting by Johanne Lamarche. Bookmark the permalink. What a sweet, sweet lady you are, Johanne! Thank you so much! 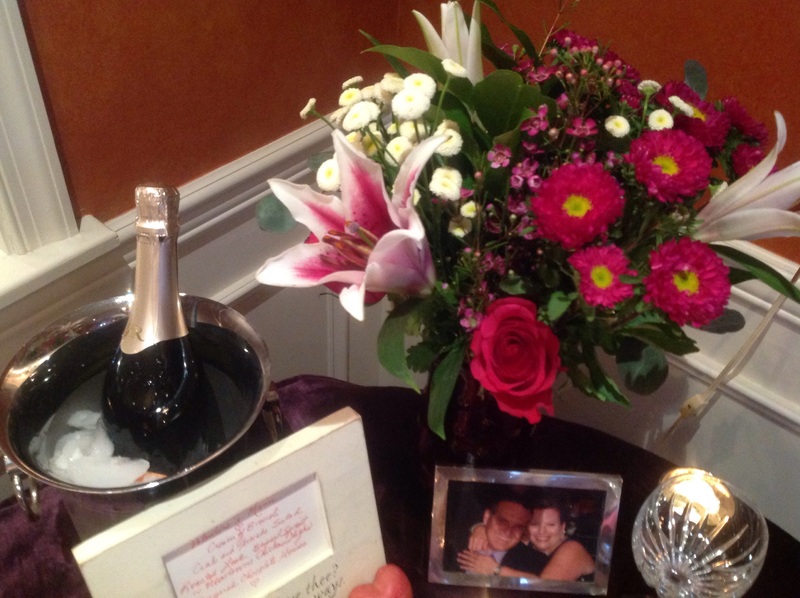 Wow…you’ve got me all verklempt! I love the mix of rich colors that leave one feeling empowered and emboldened in love. What a nice departure from the super sweet colors we’re used to seeing! 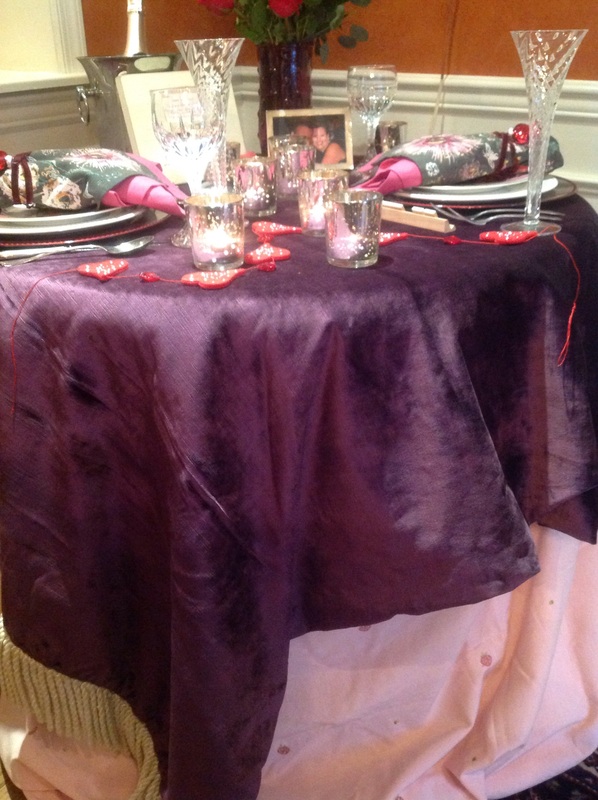 The rich purple in the throw really stands out and gives the table the oomph! For this intimate table for two, it makes perfect sense to place the centerpiece off-center. It allows for more space for holding hands across the table! 🙂 Beyond that, it doesn’t make the table look cluttered which can happen very quickly with a small table. Well done! Baccarat? Well, right on!!! On my bucket list! Thank you again for thinking of me! I’m pushing forward, not letting the pain win!!! You have such a way with words Alycia. Emboldened in love! Room to hold hands across the table! 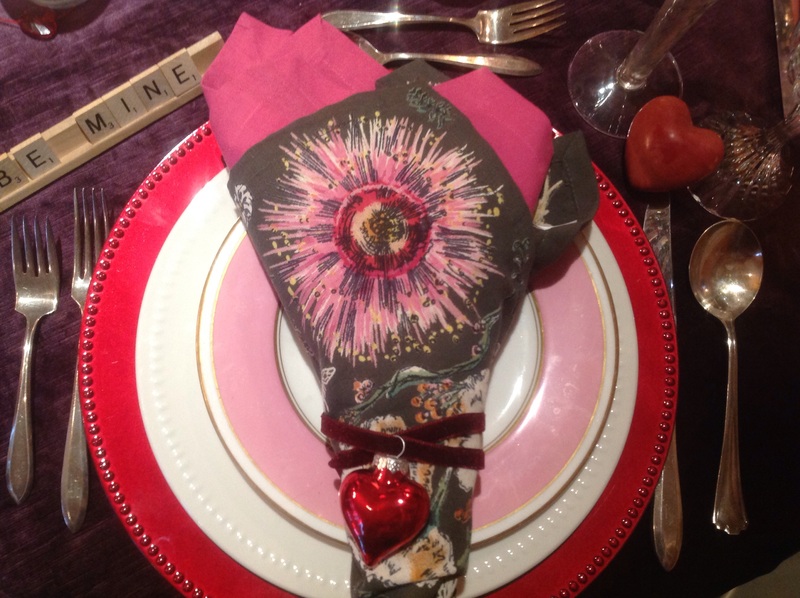 I should rewrite this blog:)) So good to hear your expert eye taking in my little tablescape and making me proud. I wonder what you would write on your Scrabble tiles? 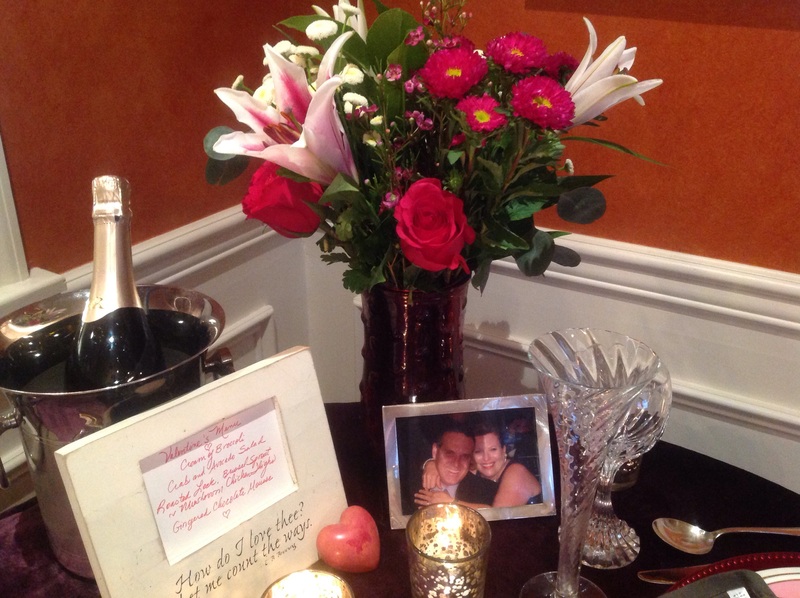 …..the Baccarat glasses were a class gift from my residency classmates, almost 23 years ago to the day. They are timeless.